Delicate lotion with witch hazel extract to perfect cleansing and freshen the skin. Leaves the skin free of superficial impurities (make-up, pollution, dust). Sothys daily cleansing milks and lotions have plant extracts specially selected according to the skin type and used in a specific way in each formula: plant milk in the cleansing milks and plant water in the lotions, resulting in perfect affinity between the formula and the skin’s needs. This lotion with witchazel extract has been specifically designed to be used on delicate skin that has a tendency to flush (couperose/ rosacea). The active herbal extracts have a mild vaso-constrictive action while imparting a cooling sensation. The lotion also hydrates the skin, leaving it clarified and relaxed. Sothys lotions use a hydro-distillation process to introduce phyto-aromatic formulations in an aqueous form. The lotions are non-alcohol/non-aggressive/non-astringent emulsions (i.e. they do not dry or tighten the skin) designed to hydrate the skin’s tissues and normalise superficial pH. Sothys treatment lotions are applied to the skin following Sothys cleansers in final skin preparation. Do not remove the remnant of the lotion from the skin. Following the cleansing of the skin, apply lotion to a soft sponge or dampened cotton pads and wipe over the face and neck. 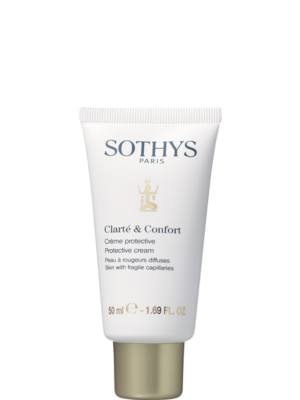 Sothys lotions are designed to leave on and be absorbed by the skin. Apply appropriate Sothys treatment serum or cream over the lotion on the skin.